I adapted this recipe for Lemon Biscuits from an old recipe book which was a fund raiser for the Cobden Pre-School Centre, from July 1968. I’ve also added lemon juice for a stronger lemon flavour, however this can be left out if you prefer a plainer biscuit. 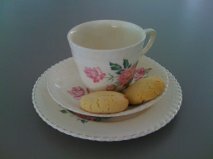 The tea set was part of Nana C’s every day set (more about her in the post for Milo Biscuits). Cream the butter and sugar together, then beat in the egg, then the golden syrup and lemon rind. Fold in the sifted flour using a metal spoon, then mix in the lemon juice. Roll the mixture into teaspoon sized balls, then flatten. Bake at 160 degrees Celsius for approximately ten minutes. Let the biscuits cool on the tray for a few minutes before moving to a wire rack.